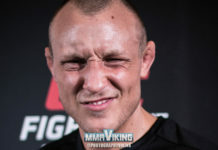 Jack Hermansson (13-2) stopped Poland’s Ireneusz Cholewa (10-8-3) with ground and pound in the third round, dominating the fight in Italy at Venator FC 3. Jack used his jab often in the first round, establishing the distance. The shorter Cholewa tried his best to land some power punch counter, but couldn’t land it. The Swede was quick on his feet tonight, in and out of range switching stances to confuse the Polish opponent. A big cut on the nose seemed to discourage the muscular opponent who had his corner work overtime to stop the blood. A huge uppercut at the end of the second showed the power of the Joker who was in complete control with superior striking. 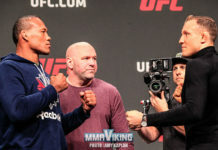 The Poland fighter took his time coming out for the third round, as the Frontline MMA fighter was energetic and waiting for the last five minutes. 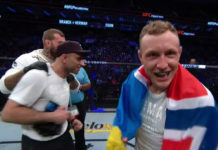 The referee however had to stop the fight at 1:05 of the third round after Hermansson got on top and jumped into full mount…. pounding away on the tired opponent. The Joker has now won eight straight bouts and this fight is coming off his recent defense of the Cage Warriors Middleweight belt over Alan Carlos (12-9) in the Cage Warriors FC 75 main event. Next articleEmil Weber Meek Shocks the World, Stops Palhares!! !